Chennai Super Kings who are on top of the points table are heading towards tough game on Tuesday. Sunrisers Hyderabad, would badly want a revenge at their home ground against the defending champions. After a great start in the IPL tournament, SRH slipped down. A must win game for SHR to keep their title hopes alive. Kane Williamson (C), Bhuvneshwar Kumar, David Warner, Shreevats Goswami, Wriddhiman Saha, Jonny Bairstow, Martin Guptill, Manish Pandey, Yusuf Pathan, Deepak Hooda, Ricky Bhui, Abhishek Sharma, Vijay Shankar, Shakib Al Hasan, Mohammad Nabi, Rashid Khan, Shahbaz Nadeem, Khaleel Ahmed, Sidharth Kaul, Sandeep Sharma, Natarajan, Basil Thampi and Billy Stanlake. Possible Playing 11: David Warner, Jonny Bairstow (WK), Kane Williamson (C), Vijay Shankar, Deepak Hooda, Yusuf Pathan, Abhishek Sharma, Rashid Khan, Bhuvneshwar Kumar, Sandeep Sharma and Khaleel Ahmed. Mahendra Singh Dhoni(C), Suresh Raina, Shane Watson, Ambati Rayudu, Kedar Jadhav, Dhruv Shorey, Ruturaj Gaikwad, Sam Billings, David Willey, Ravindra Jadeja, Dwayne Bravo, Faf du Plessis, Karn Sharma, Harbhajan Singh, Imran Tahir, Mitchell Santner, Deepak Chahar, Shardul Thakur, Mohit Sharma, Monu Kumar, KM Asif, Murali Vijay, Chaitanya Bishnoi, N Jagadeesan and Scott Kuggeleijn. 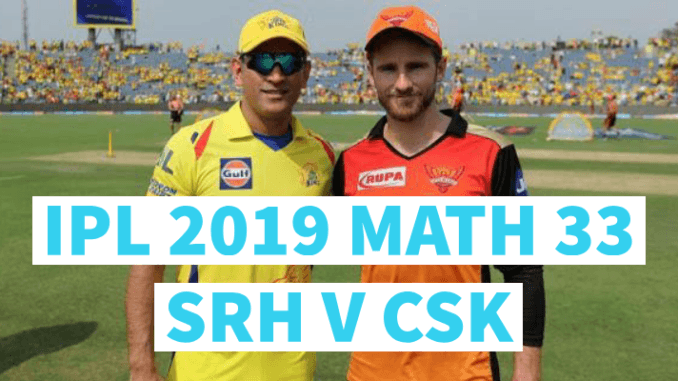 Possible Playing 11: Shane Watson, Faf du Plessis, Suresh Raina, Ambati Rayudu, Mahendra Singh Dhoni(C&WK), Kedar Jadhav, Mitchell Santner, Ravindra Jadeja, Deepak Chahar, Shardul Thakur and Imran Tahir.